It’s Pie Day Friday again! Thank goodness. 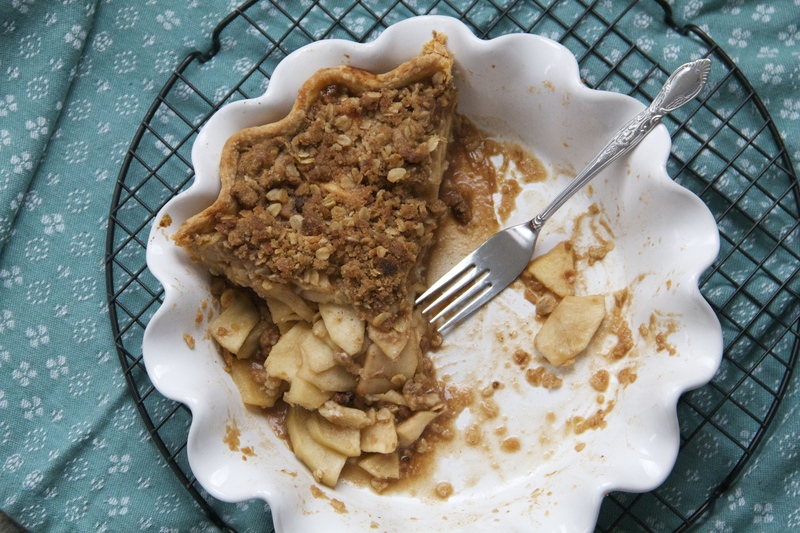 This week in Seattle has been pretty dark and rainy and a little bit tired, too, so a fat slice of Apple Crumb Pie seems like the right thing to do today. I brought this pie to a big family dinner last weekend. All of the cousins can’t be together on Christmas, so we celebrated a few weeks early with big plates of homemade macaroni and cheese, fake Santa beards/reindeer antlers, and plenty of pie to go around. Plus ice cream, because warm pie duh and also because Christmas. I love the warmth and comfort of homemade apple pie. On a chilly, windswept and drizzly day, is there anything better? 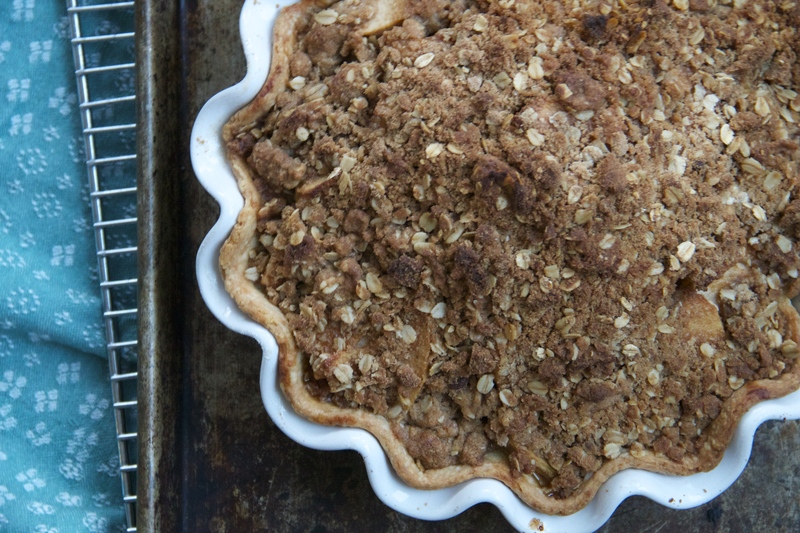 Flaky, all-butter crust meets spiced and yielding apples meets crisp and oat-y crumbles. Say it with me: YES PLEASE. And I love how easily this pie turns from dessert into breakfast, without even batting an eyelash. It just makes sense and feels right so let’s just hold hands and eat some pie, okay? Ice cream optional (but not really). You can be loosey goosey with some of the spices here – cinnamon is kind of essential, but if you don’t have ginger or nutmeg or cloves, it won’t much matter. Don’t skip the orange zest and juice, though – I love the fresh flavor it brings. Also, if you’re feeling kind of lazy and want to skip the bottom crust and call this thing an Apple Crumble, I’m on board. Either way, enjoy! Make sure the pâte brisée dough has had time to chill before rolling it out, on a well-floured surface, into a large circle, about 1/4-inch thick. Carefully transfer the dough to a 9-inch pie plate, and crimp the edges if you’d like. Let the crust chill in the refrigerator while you prep the apples. To prep the apples, gently mix the apple slices, lemon juice, orange zest and juice, brown sugar, cornstarch, salt and spices together in a large bowl. Set aside. In a medium bowl, make the crumb topping by whisking together the flour, sugar, oats, cinnamon, nutmeg, ginger and salt. Add the cold butter and use your hands to work it into the dry ingredients, tossing and pinching, until the butter is the size of small pebbles and lentils. Set aside. Pour the apples into the prepared (unbaked) pie shell, and top liberally with the crumb topping, covering the apples completely. Place the pie dish on a sheet pan and slide it onto the oven (the pan will catch any overflow/drips). 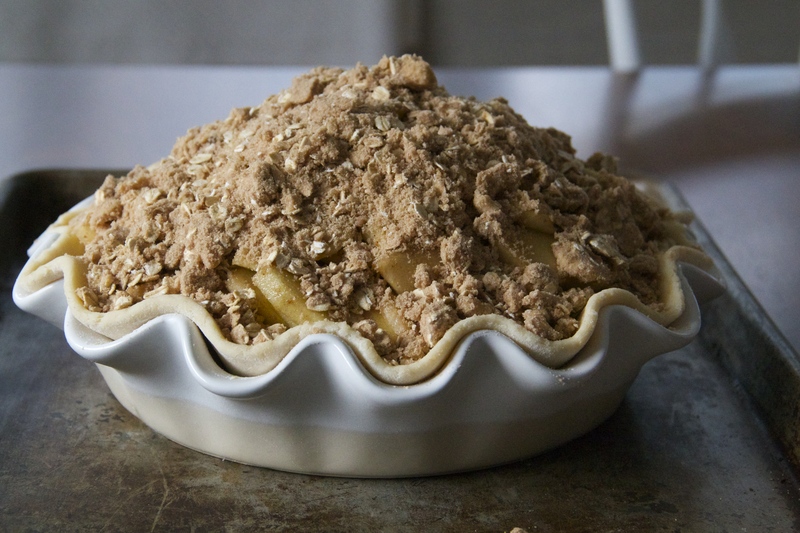 Bake the pie for about an hour, or until the crust and crumble are deeply browned and the apples are cooked through and bubbly. Allow pie to cool slightly before slicing generously and serving with a scoop of vanilla ice cream. Monster pie! I mean, dang. Love the oat crumble.